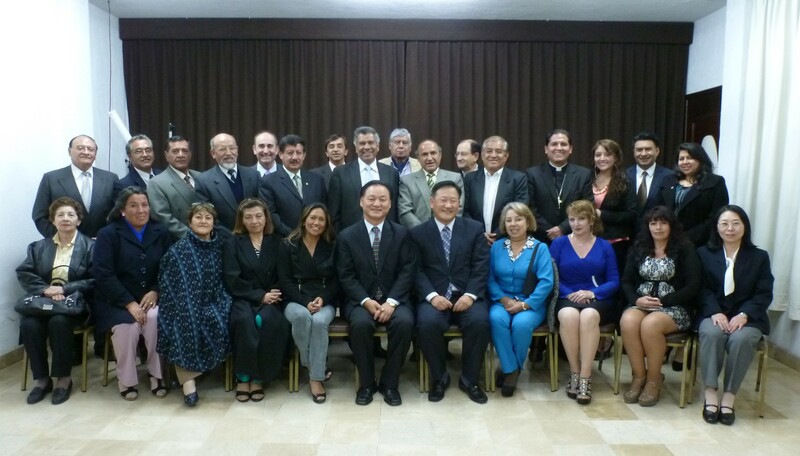 FFWPU South America: Celebrating the International Day of Peace, 24 ambassadors of peace met in Quito, in the last Day of September (September 30) , Dr. Chang Shik Yang and Rev. Dong Mo Shin, traveling for several country of South America. The Executive Director of UPF of Ecuador, Ms. Hirumi Michima gave welcome to all ambassadors. After that, she called Dr. Simao Ferabolli, the General Secretary of UPF Latin America to introduce Rev. Dong Mo Shin, Continental Director of South America, who was coming for the second time to Ecuador. He also gave welcome to all ambassadors and say that he was very move visiting the line of Ecuador, (metad del mundo), the same place that True Parents visited in 1996. After that He introduce Dr. Chang Shik Yang, the special emissary sent by True Mother to the Americas, who was coming to Ecuador for the first time. In the beginning, Dr. Yang gave a welcome and thanked all ambassadors for their effort for UPF chapter in Ecuador. Than, he present the video about the work of UPF and other organizations around the world done for the second anniversary of Seong Hwa of Father Moon. After the video, Dr. Yang gave a brief explanation and show slides about the World Summit 2014, encourage the ambassador for peace to have some representative guest from Ecuador for the next World Summit. Than he explained his experience working together with religious leaders when True Father, 30 years ago send around the world, 150 religious leaders from ten main religious, during 40 days, visiting the holy places of each great religions. They start like enemies in some cases, but in the end they really could experience the feeling of brothers and sisters. The main ambassadors for peace present in this event in Quito were Rev. Dr. Luis Rodrigues Moreno, Bishop of ICAE (Anglican Church), Dr. Franklin Henriquez, who is working with a NGO called AMISRAEL, Dr. Oswaldo Salazar, ex-president of Olympic Committee in Ecuador, Dr. Marco Torres Andrade, Rector of INSTA – Superior Technological Institute of Appropriates Technology and Global Vice-president of Sun Moon University, Dr. Leonardo Montoya, who is a Filosofer and working with inter-religious dialog, Partor Castro Leiton, who is a Evangelic Pastor from Rosa of Sharon Church and representing the womens, Miryan Valdineso Veja, former rector of High School Fry Jodoco Rique, Dr Cecilia Vaca, former rector of Primary School of Reino of Quito and Dr. Vicente Cárdenas, special assistant of TCE – Tribunal Contencioso Electoral. After a comemorative phto we had a delicious refreshment.